This entry was posted in Poems, Writing and tagged fiction, poem, poetry slam, rondeau. Bookmark the permalink. This is really beautiful. I love the vivid imagery and the smooth meter and rhyme, and the sensual language really enhanced the subject of your poem. I wasn’t sure exactly what you meant by “the stark divide,” although it did fit in with the general theme of contrast. That’s my only nitpick though – overall, I thought you nailed the form, and I really enjoyed this poem! Thank you! I was thinking of the sharp line between light and shadow. I struggled with that bit though; the B rhyme I chose was really challenging, I found. I’m not going to lie, I have a hard time reading poetry like this sometimes when I know the line breaks are there for a reason (because it’s a rondeau) but it doesn’t make sense in my head. So, when that happens I just read it over a few times aloud, each sentence by itself regardless of where it is placed, and it was after I did that that I realized how amazing this poem is, and what a great little (sad) story it is, the story of an affair. Or not a dude. I like that the narrator is ungendered, allowing (most) readers to impose their own preference. I’ve always loved when the flow of a poem (not necessarily the rhyme or meter) suits the images that play out in my head. In this case: a dance. Something about the way you wrote it, the flow of the words and images and even just the words themselves, beautifully reflect the dance lovers engage in. Really gorgeous. Make sure you read Cole’s ballade – it’s a great example of this very thing. I did 🙂 I read all of the entries on the grid and comment. 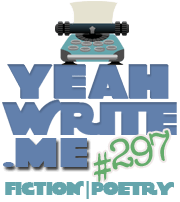 Call me the yeahwrite stalker. “My sheets like moonlight cast upon the floor.” Man, I wish I’d written that.